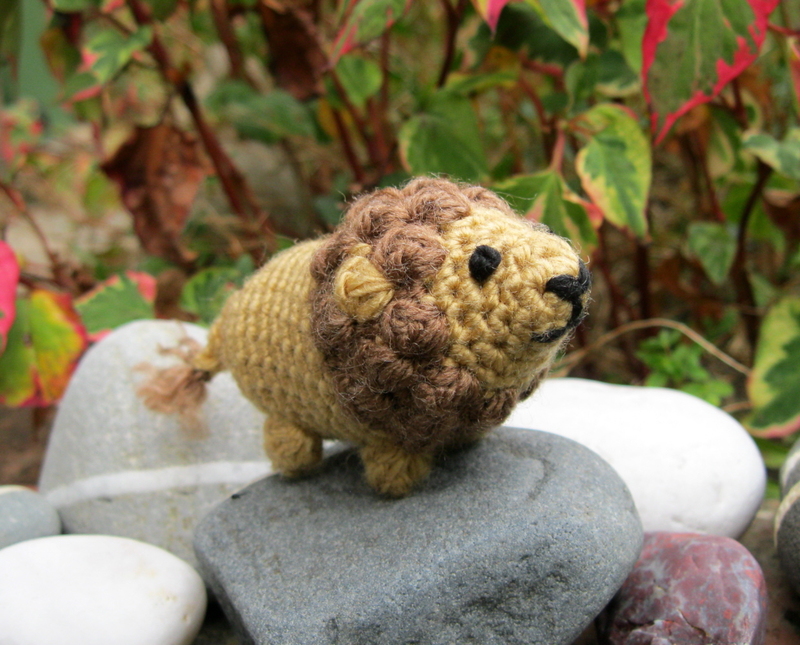 As I promised yesterday, check out the ferocious new pattern by Lucy (Blog / Etsy), here it is, Boris the Lion! Work in rounds unless otherwise stated and do not join rounds unless told to. Use a stitch marker to mark the start of a round - a small piece of different coloured yarn placed under the stitch at the start of the round will do. To start a round, you can use the magic ring method, but I prefer (ch2, work 6 sc into 1st ch). If you work the 6 sc over the tail of yarn as well you can use that to pull the hole tight. Small amount of yellow/gold yarn. Small amount of brown yarn. Small amount of black yarn. 5 dc pop: popcorn stitch for legs. Work 5 dc into 1 st, take hook out leaving loop, put hook through 1st dc & pull loop through. 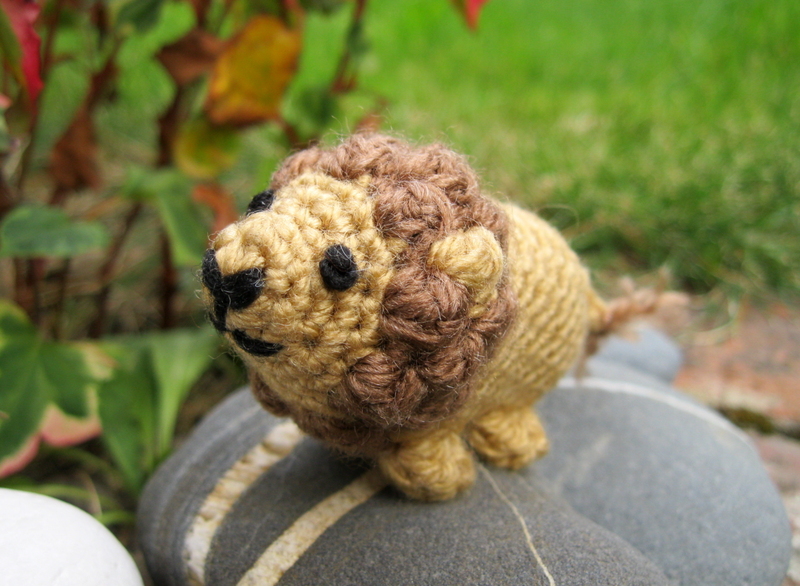 3 dc bob: bobble stitch for mane. YOH, insert hook into next stitch, YOH and pull through stitch, YOH, pull through 2 loops, *YOH, insert hook into same stitch, YOH and pull through stitch, YOH, pull through 2 loops, repeat from*, YOH, pull through all 4 loops on hook. Round 2: [2 sc in next st, sc in next st] 3 times – 9 st. Round 3: Sc in each st around - 9 st. Round 4: [2 sc in next st, sc in next 2 st] 3 times – 12 st. Round 5: [2 sc in next st, sc in next st] 6 times – 18 st. Round 6: Sc in each st around - 18 st. Round 7: [Sc in next st, 3 dc bob in next st] 9 times – 18 st. 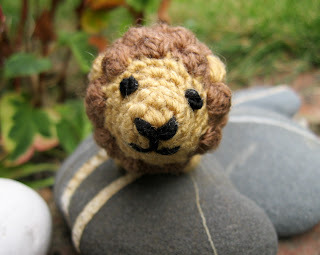 Round 8: Sc in next st, [sc in next st, 3 dc bob in next st] 8 times, sc in next st – 18 st. (Optional: to make ears do the 2nd and 5th bobbles in the yellow/gold yarn). Round 9: [Sc in next st, 3 dc bob in next st] 9 times – 18 st. Round 10: [2 sc in next st] 2 times, sc in next 12 st, [2 sc in next st] 4 times – 24 st. Round 11: 5 dc pop in next st, sc in next 19 st, 5 dc pop in next st, sc in next 3 st – 24 st. Round 12: Sc2tog, sc in next 18 st, [sc2tog] 2 times – 21 st. Round 13 - 15: (3 rounds) Sc in each st around - 21 st.
Stuff as far as you can and embroider face with black yarn. Use French knots to make eyes. Round 16: Sc in next st, 5 dc pop in next st, sc in next 16 st, 5 dc pop in next st, sc in next 2 st – 21 st. Round 17: Sc in each st around - 21 st. Round 18: [Sc2tog, sc in next 5 st] 3 times – 18 st. Round 19: [Sc2tog, sc in next st] 6 times – 12 st. Round 20: [Sc2tog] 6 times – 6 st.
FO, leaving length of yarn. Finish stuffing and sew up hole at end. Ch 5, turn, miss ch next to hook, ss in next 4 ch. FO and sew to bottom. 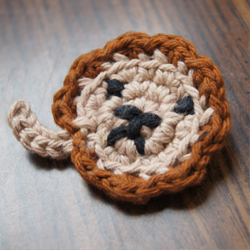 Sew or knot a little bit of brown yarn to the end to make a tuft. 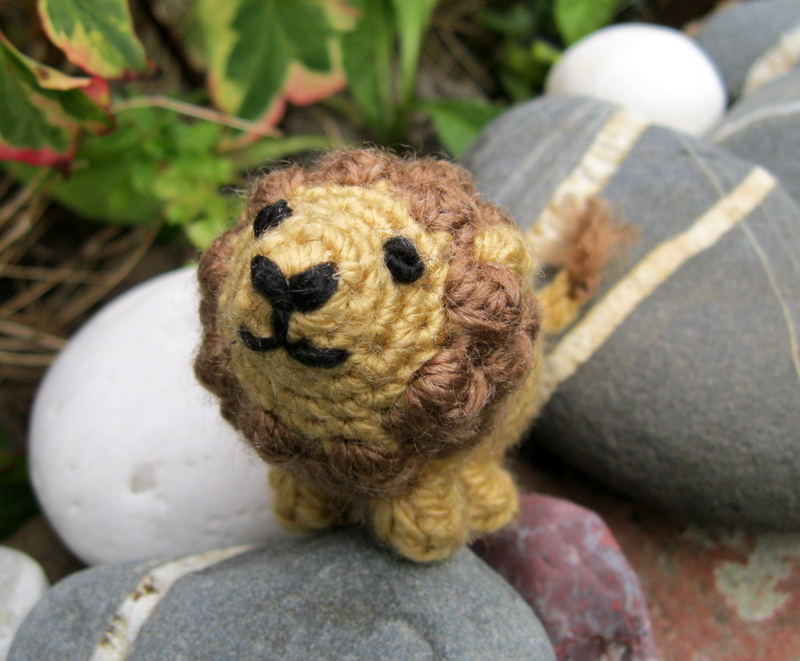 Don't forget to check out my free pattern of Leroy the Lion pin on her blog here! So adorable!! Thanks for sharing and being so generous with your ideas.